The young girls from Bengaluru made the long Mount Everest Base Camp trek from Kathmandu with the help of their parents, raising funds for an NGO that helps rescued victims of child trafficking. 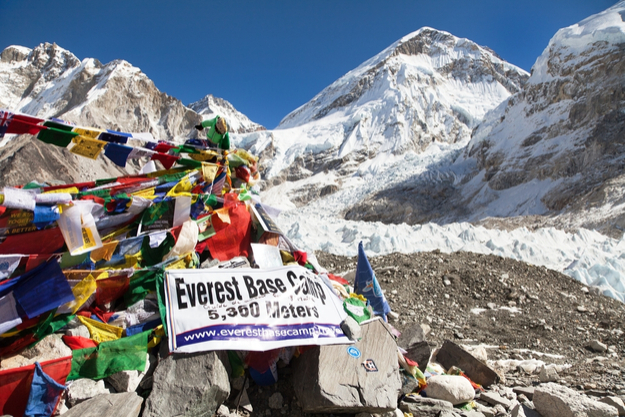 The Mount Everest Base Camp trek from Kathmandu is a dream for any avid trekker. It is challenging and breathtaking at the same time, and it brings you at the feet of the tallest mountain in the world. And while many approach this trek for the thrill or to quench their thirst for adventure, a duo of young girls from the Satellite City of Bengaluru did it for an incredibly noble cause. The girls, Gauri and Venya, are just 13 and 12 years of age, and they had the heart and moxy to complete the arduous trek for the benefit of children who have fallen prey to human trafficking. Human trafficking is a major concern in Nepal as well as India. In 2016 alone, child and woman trafficking cases rose by almost a quarter to around 19,000, and that’s just the government data. The actual figure is probably even higher if you account for unregistered cases. Meanwhile, trafficking young girls from Nepal to India is one of the busiest routes in the world. Many have been working to stop this evil, and for these girls, currently studying at an international school, to do their part for the cause is extraordinary. Through their trek to the Himalayas, the sisters were able to raise up to $5,000 for the NGO Maiti Nepal, established by social worker Anuradha Koirala. The girls were exposed to the dark world of human trafficking in their trip to Nepal a couple of years ago. They witnessed a landslide and smugglers trying to take away the women and children who lost their families and homes to the disaster. The visit changed their entire world, filling them with determination to raise awareness and do what they can to curb the menace. And that brought them to the good people of Maiti Nepal, who work from the capital city of Kathmandu, where they have a rehabilitation home. The NGO also runs transit homes located along the India-Nepal border. Gauri and Venya began to raise funds for the organization from March 2017 through a crowdfunding website. They raised $5,000, and the two girls left for their trek on 7 April with their parents to keep them safe. Their trek began two days later, and they reached the Everest Base Camp on 17 April, carrying a banner of support for their cause. The Everest Base Camp trek, which takes you to elevations of over 18,000 feet, is a difficult grade trek that is more accessible and doable for the average trekking enthusiast than other treks across the treacherous Nepal Himalayas. There are lodges and other serves all along the route, and certified guides to show you the way and introduce you to the local sights. But even though this is one of the better-marked and planned trekking trails in the Himalayas, the base camp trek is still very difficult and dangerous, especially for girls as young as Gauri and Venya. Their father, Vinay Chandra, said that the family underwent a training regimen 2-3 months before the trek, adding that he and his wife needed more preparation than his kids. Three days later, the girls and their supportive parents visited the Maiti Nepal operations, spending quality time with the rescued children and women and learning about the trafficking operations and how the NGO works to prevent these activities and support the victims. Women and girls are lured into the slave trade on false promises of jobs in the Middle East and India. Girl children are the less preferred gender in Nepal, as is the case here in India, and several families prefer to keep their girls away from school, considering education a waste of time and resources. In their time at the NGO, Gauri and Venya met many children and women affected strongly by human trafficking. These victims carry mental scars that will last for a lifetime, and many carry physical ones. At the end, the sisters returned to their home even more determined to do what they can to spread the message.